Crafty escapism: Are you a rider, yanker or lifter? Are you a rider, yanker or lifter? I've been getting a little obsessed about gauge recently. One of my students wants to make crochet socks and we told each other we'd make gauge swatches in advance of the next workshop. I don't swatch very much apart from when the size matters but I know I should really do it more often. 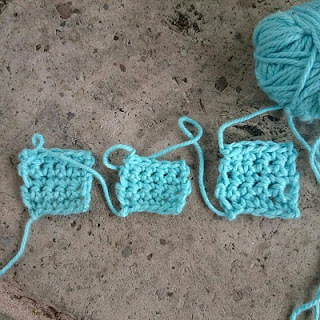 Swatching is a sensible thing to do to make sure you don't run out of yarn too. And designers make gauge swatches to find out if the yarn suits their pattern. I do always ask my students to swatch though. It IS good practice. They shouldn't be reckless just because I am! trying out riding, yanking and lifting. Changing gauge to accommodate differences in width is simple - just go up or down a hook size. But what about height? In making the gauge swatch for my socks my 23 rows are only 8 cms tall (it's a British pattern) instead of the 10 cms the pattern designer has given for the swatch height. So I've been hunting around online on see if there is a fix. I have a sneaking suspicion that my stitches have always been too short historically. But usually this doesn't matter because the pattern says work pattern rows until the item measures however many inches. 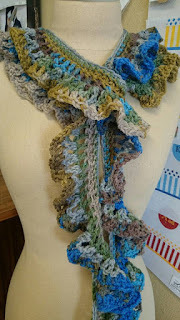 A post by Marty Miller on her Crochet Doctor blog: What else affects gauge gave me some ideas on what I should try. Marty is a crochet designer, author, tech editor, and teacher - both locally and nationally. She is also a Craftsy instructor with a rather exciting looking class on Mastering Foundation Crochet Stitches. Marty gives a lot of helpful advice here and I found out that yanking my yarn to tighten the loop on the hook or letting my hook rest on the top of the stitch below could be my issue, causing my stitches to be too short. I should lift my hook up, above the stitch below, to give the yarn some "breathing space" and keep my hook almost parallel to the top of the stitch below. I tried it and it worked! Yay. I just realized that I have made a pattern by Marty Miller recently. It was in the latest edition of Interweave Crochet Spring 2016 (the 10th birthday collector's edition no less) and I made it as a sample for the yarn store where I work. It turned out really really well. Check it out on Ravelry: The Rufflier Scarf. Here is my version. And then I found a fascinating video tutorial by crochet designer Deja Jetmir on her Crochet Ever After blog with further information. Deja has over 400 tutorials on youtube - a fantastic learning resource. Deja describes "the Golden Loop Method" of altering gauge height: Fixing gauge when height is incorrect aka Golden Loop Method. The golden loop is the first one that you pull up and how you deal with this first loop makes a big difference to the height of your stitch. Watch it to find out if you're a rider, a yanker or a lifter! OK Kathy a post on crochet socks is on the schedule!